Don’t let the cute looks of this game deceive you, because there is quite some meat to this one that even challenges more experienced board game players. 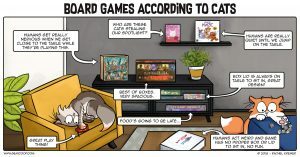 In this game, you and your fellow cat ladies try to collect the most points by drafting cards in the different categories like toys, food, catnip, silly costumes, and of course cats. But keep in mind that cats need to be fed!